The flavors in the salad are like a little friendly fresh-summer-explosion in your mouth. Just amazingly delicious. 1. Puree all the dressing ingredients in a food processor until smooth. Taste and adjust to fit your preferences. Transfer to a dressing jar and rinse the food processor out for use later. 2 Cook the edamame by boiling it for 3-5 minutes in a pot of boiling water. Drain and allow it to cool. Meanwhile, slice up the kale, carrots, peppers, cilantro leaves, and green onions into thin strips or shreds. 3. Place the cooked edamame in the food processor and pulse 5 times to get a minced texture. Transfer to a bowl and repeat the same process for the cashews. 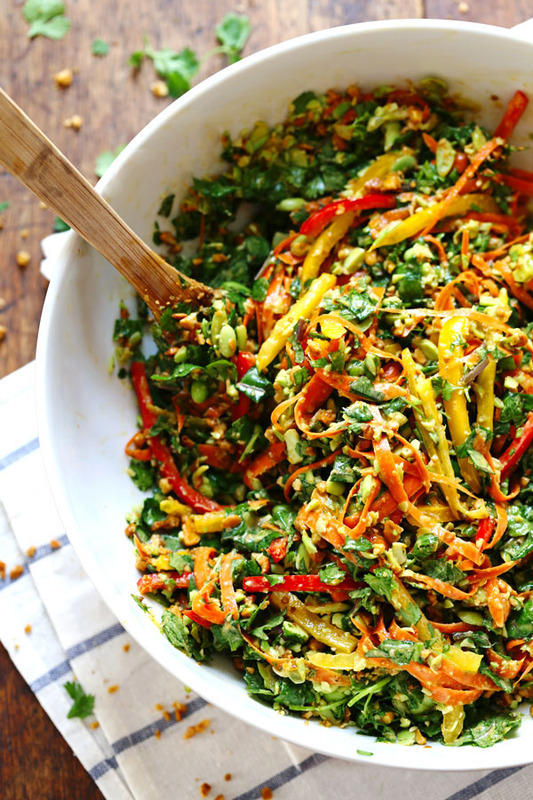 Toss the kale, carrots, peppers, cilantro, green onions, edamame, and cashews together until well combined. Drizzle with the dressing, toss gently a few times, and serve immediately.